The book collection of the library consists of books, back-volumes of periodicals, festival proceedings etc. Most of them are kept on open shelves directly accessible to the users, while some are preserved in closed stacks and made available only on request. These books are kept in different stacks. There are two sections – Reference and Lending. The books are arranged by decimal numbers. Each book is assigned a number from Dewey Decimal Classification (DDC) system, widely followed in many libraries across globe. This number represents the subject of the book. On the shelves, the books are then arranged according to the numbers which are indicated on the spine of the books. Please consult the computerized catalog to find the availability and location of a book. Books bearing class number from 001 to 999 are housed at different Stacks in the ground floor of the library. At different intervals, new books that were added to our stock, are displayed in the New arrival section. A list of such new additions is displayed on the notice board of the library as well as on this website. The books remain on display for one week after which those can be borrowed. Reference collection including Encyclopedias, Dictionaries, Directories and Handbooks, etc. and some basic books of general nature are available on open shelves in the Ground floor Reading Hall. These are meant for consultation within the Reading Room and must not be taken out by the students. Only faculty members may borrow the books from Reference Section. Lending collection including textbooks, film scripts, handbooks fictions, Bengali and Hindi language books etc. and some basic books of general nature are available on open shelves in the Ground floor Reading Hall. Students as well as faculty members may borrow the books from Lending Section. Many books and journals in our collection are accompanied by learning materials in CD/DVD format. Those accompanying materials are kept separately. The book catalog will indicate whether a book has an accompanying material. To borrow those materials, please contact Users’ Assistance Desk. 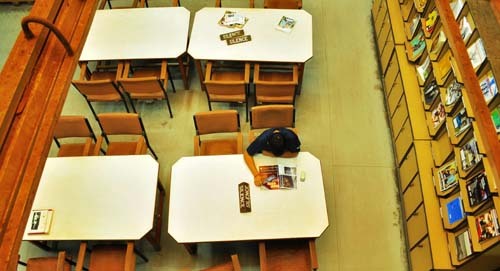 The library subscribes to a large number of journals, magazines and newspapers. All current issues of journals, newspapers, and magazines are displayed in the Reading Hall in the ground floor. Back volumes of journals, in bound condition, are housed in first floor of the library. The library has a large collection of databases of audio-visual materials. This collection contains Students diploma films and projects, Classics, Short films, Documentaries and Feature films. Please consult Users’ Assistance Desk for the details. The Online Public Access Catalogue may also be reffered. SRFTI Kolkata has institutional membership with British Council Library located in the city. Do not bring any food with strong odor, inside the library. student for all library material(s) issued Rs 1 / per day after the due date.